Before you move tomato plants outdoors, you will need to ‘harden’ them off. For more information on hardening off your plants see: Growing Tomatoes: Step 2 (Growing from Seed). Tomatoes are sun-lovers and need at least 6 to 8 hours of full sun every day to produce good fruit (especially in northern climates that may experience colder days). If you live in a colder climate, wait to plant your tomatoes outdoors until early spring (and after the threat of frost has passed). If you live in a hot climate, plant your tomatoes in early autumn, when temperatures have begun to cool. Many gardeners begin preparing the planting area (using a garden fork or tiller) at least a week before placing their plants in the ground. It can be effective to begin working the soil and removing rocks and weeds when I you start the process of hardening off the plants (or about a week before planting time). You will want to return to your garden and rework the soil at least once more before planting. For tomatoes, the soil needs to be loosened to a depth of approx. 6 to 8 inches. During this process you can also work in your compost. Tomatoes prefer relatively acidic soil (around 6.0 to 6.8). It is not required, but can be useful, to purchase a soil PH test kit. You can find them for $17 Here. To test your PH, dig a small hole in the ground and fill it with water, let the water sit for a few moments and then insert the test into the puddle. If you find you need to increase the PH of your soil, you can slowly work lime into the dirt until you are satisfied with the test results. To reduce the PH, try using aluminum sulfate (which can be found at most garden centers). When your plants are hardened off and your soil is well prepared, you can begin placing your tomatoes in the ground. Plants should be spaced anywhere from 12 to 24 inches apart (check the information on your plant label or seed packet). Tomatoes should be transplanted fairly deeply (all the way up to the second set of true leaves), the buried stems will form their own roots and actually develop a stronger root system this way. You may also want to consider facing the plants similarly, so the stems that have the heaviest blossoms and likeliness to produce fruit will face the same direction (this helps if you are planning on using stakes as supports). After planting, you can choose to protect the plants further until they are well established. This can be done in a variety of ways, (one example suggests encircling each plant with a section of one-foot-high black felt roofing paper). Protecting the plant from ground pests can be done by burying a paper collar or tube slightly below ground level, encircling the stem. Immediately after you have finished planting, you will want to install your supports. This can be done using either cages or stakes. If you are staking your tomatoes you will need either wooden or metal stakes 5 to 6 feet long for indeterminate varieties and 3 to 4 feet long for determinate varieties. Wooden stakes should be at least 1 inch thick, but metal stakes can be smaller. Do not use chemically treated wood (rebar makes an excellent, long lasting tomato stake). Many gardeners choose to drive a stake next to every plant and tie each plant to the stake, but you can save on stakes by using the “Florida Weave,” method instead. To use this method, drive a stake at every-other plant in the row. The stakes should be about 3 to 4 inches distance from the base of the plant. Drive stakes in the side opposite the first bloom cluster (to prevent the fruits from being trapped against the stake). Use polypropylene cord (this will not stretch with weight), and tie it firmly to your first post (about 6 to 8 inches from the ground). Run the cord to the next stake, wrapping around once. Continue this process until you reach the end of the row, then circle around and repeat until you are back to the first stake again. This method creates two parallel cords which the plants grow between. As your plants grow, continue to add new rows of cord for higher support. 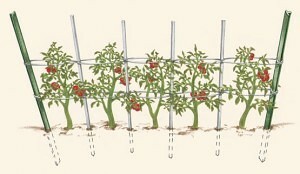 You should need about 3 to 5 runs of cord to properly support most staking varieties of tomato. Remember to keep pruning your plants as they grow to reduce the amount of plant material that must be supported. You will also need to tie the plants to the cord as they grow (to hold them in place). Tomato plants supported by cages (best made from concrete reinforcing wire) require less work than staked tomatoes because you will not need to tie them and they will only require limited pruning. You will need a 5-foot length of 10-gauge reinforcing wire (with 6-inch openings) to make a cage of about a 18″ diameter. You will want them to be about 5 feet tall, unless you are planting determinate varieties, in which case, they can be shorter (check your plant details to see how tall your variety will grow). Place a cage over each plant and push the legs into the ground to anchor it. Using cages will also eliminate the need to protect your new plants using roofing paper, since you can simply wrap plastic around the base of the cage (up to about 12 to 18 inches high). Caged plants are usually pruned to four or five main fruiting branches. As they grow, keep turning the ends of the branches back into the cages.